Description: Like a complex gyroscopic structure, Timeless Bronze finished steel rings create a unique curvature pattern that evokes the illusion of revolutionary motion like a spinning gimbal rotating on its axis. 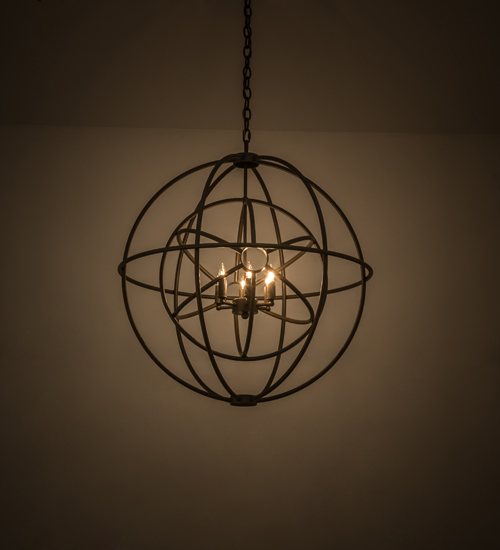 The orbed frame envelopes a smaller frame similar to one that represents atomic energy, which wraps around an elegant Amber-colored faux 6-light candelabra. Custom crafted in the USA, this fixture is available in custom colors, designs and sizes, as well as dimmable energy efficient lamping options such as LED. The chandelier is UL and? cUL listed for damp and dry locations.